Indeed, most women aren”t cut out for careers, as I bitched only one column ago. (Don”t get me started on voting…) Alas, The Mary Tyler Moore Show made having one look so goddamn attractive and accessible. No, I was more impressed, and felt more validated, by Mary Tyler Moore’s most famous big-screen characterization, the grieving mother Beth in 1980’s Ordinary People. Cold, rigid, bitter, fastidious”celluloid Martha Stewarts”there are few “Beths” in American cinema: Crawford’s eponymous character in the curio Harriet Craig; Miriam Hopkins” “Millie” in Old Acquaintance; and later, Annette Bening’s “Carolyn” in American Beauty, and Kathleen Turner in Serial Mom. I wouldn”t say “like,” but I seem to be alone in my reading of the character as justifiably angry: at her favorite son for dying, and her (probably unplanned) younger one for being “responsible” and then trying to die too. Temperamentally masculine, she’s nevertheless dutifully performed midcentury American femininity her whole life”the perfect hair, home, and smile”but can”t, won”t, dammit, express feelings she doesn”t have. But of course, Mary Tyler Moore will always be best remembered as the warm, lovable woman she played on the small screen. I always saw myself more as Hazel Frederick. A middle-aged Minneapolis mom”back when “middle-aged mom” meant you tied a scarf around your head to keep your already lacquered hair from, improbably, blowing around”who happened to be shopping downtown the day Mary was filmed tossing her beret in abandon, Hazel was freeze-framed, casting what looks like a disapproving scowl at the skinny, stunning young woman spinning in the middle of the street. 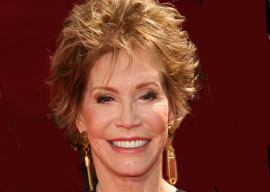 World-famous but nameless, Frederick finally introduced herself to Mary Tyler Moore at a book signing, and explained, needlessly, of course, that she hadn”t been particularly crabby that morning, just, understandably, surprised. I wish she hadn”t. I preferred the idea that this grim babushka lady, lower left”like a Victorian ectoplasm, but real”was the specter of old-fashioned womanhood, being reduced to a forever blur by the ever-multiplying Marys in her midst.